EGL PuraciteTM specializes in the production of anthracite filter media for drinking water, sewage treatment, industrial and petro-chemical applications. Optimisation solutions for filtration applications often lie in the filter media bed and improving its performance. Increasingly stringent effluent water quality and backwash re-use guidelines are driving the specific need for the water treatment industry to optimise and upgrade filtration systems. 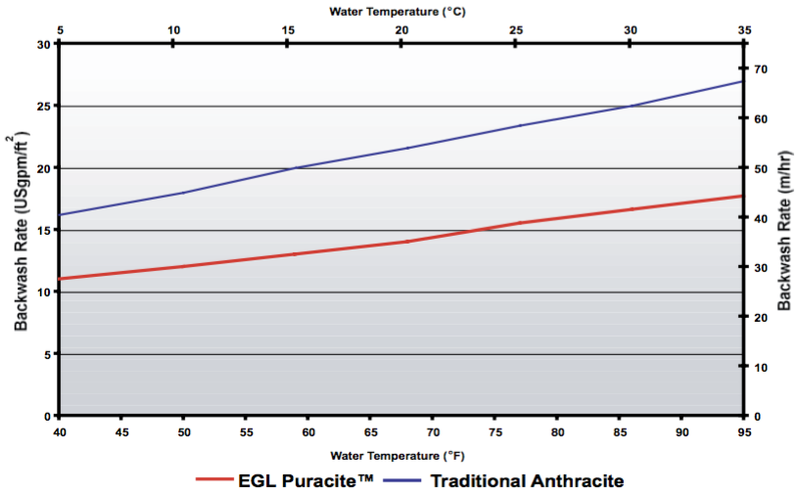 EGL Puracite™ filter anthracite offers many advantages over traditional filter anthracite. The advantages of EGL Puracite™ can be realised in a wide range of granular media filtration processes, including: surface and ground drinking water treatment, sewage treatment, industrial and petro-chemical applications. Numerous filtration facilities in Europe, Asia and North America are currently using EGL Puracite™ filter anthracite. N.S.F. Standard 61 – Process Media Drinking Water System Components. Conforming to ANSI/AWWA B100 Standards. Produced in the UK to EN12909:2012 standards. EGL Puracite Ltd. is an ISO 9001:2008 registered company.